String argument and prints it along with your message. that calls all the different versions. class in main( ) to verify that the default constructor is automatically synthesized. called for the object a or b? but it gives you an idea of what\u2019s happening. Suppose you\u2019re inside a method and you\u2019d like to get the reference to the current object. straightforward coding style saves time and money. // Simple use of the &quot;this&quot; keyword. multiple operations can easily be performed on the same object. itself to the foreign method, it must use this. working; you should not use this form in practice. //! this(s); // Can\u2019t call two! thing you do, or you\u2019ll get a compiler error message. 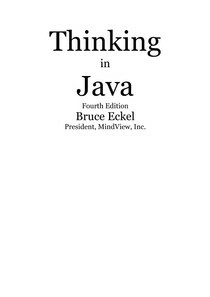 in Java code, and it\u2019s used in numerous places in this book. inside any method other than a constructor. Exercise 9: (1) Create a class with two (overloaded) constructors.